This is an incredibly hard set to guard. Great action leading to an empty middle ball screen and if 1’s defender is tagging the pick and roll like he should be, 1 will either be open on the throwback or 5 will be wide open at the rim. 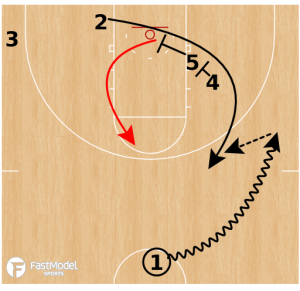 Highly recommend watching Coach Few’s teams play with scratch paper handy or FastDraw open! 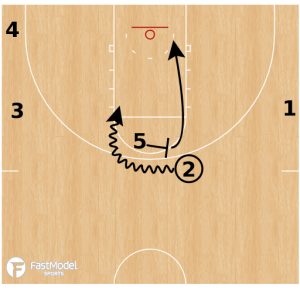 5 and 4 set a stagger screen for 2 who cuts up to the slot. 1 dribbles to the wing. 4 cuts to the opposite corner. 5 sprints into a ball screen and roll with 2.